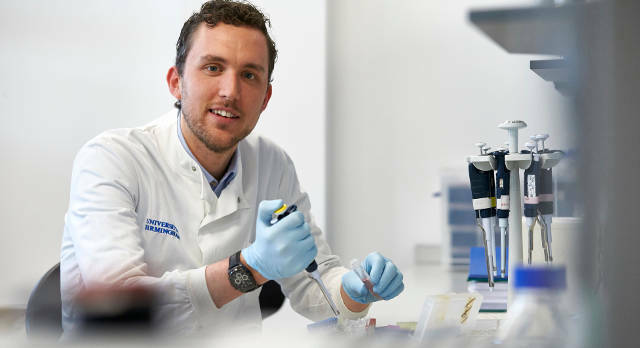 NIHR Surgical Reconstruction and Microbiology Research Centre (SRMRC) Postdoctoral Research Fellow Jon Hazeldine has been recognised for his work on the ground-breaking Golden Hour study. Jon picked up the prestigious award for the Best Oral Presentation at the University of Birmingham’s Postdoctoral/Early Researcher Career Development and Training (PERCAT) Research Gala, held in the Great Hall of the historic Aston Webb Building. His prize was a £500 travel grant to allow him to attend a conference of his choice in the future. Twelve presentations were spread across various topics during the event with Jon’s talk, entitled “Immune dysfunction within minutes of major traumatic injury: Results of the Golden Hour Study”, featuring in the Molecules and Cells section. He presented findings that he has collected so far from the patients enrolled into the Golden Hour study, which is being conducted by the Queen Elizabeth Hospital Birmingham-based NIHR SRMRC trauma research team. The study is investigating changes in the immune system that occur within one hour of major traumatic injury. “I presented data that shows that even before a trauma patient arrives at the Accident and Emergency department, their immune system is suppressed in the immediate aftermath of injury when compared to that of a healthy volunteer,” he explained. “I also presented some preliminary data that suggests that assessing a patient’s immune response 48-72 hours post-injury has the potential to identify those patients who are at an increased risk of developing infection whilst in hospital. Jon added: “Winning this prize will give me the opportunity to go to an international conference and showcase the research of the NIHR SRMRC to scientists from around the world.